Format is now accepting wallpaper submissions for the Sneaker Wallpaper Contest. 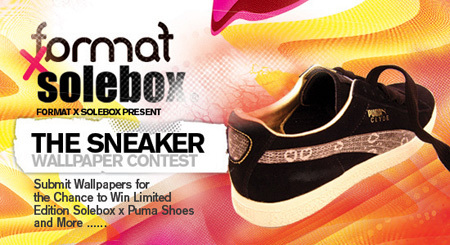 This is an exciting opportunity for anyone who missed the initial drop of the Solebox Puma Clyde’s to win a limited edition package from Solebox x Puma, and have their art exposed to the world! For full contest information, including guidelines and prize listings, click here. Deadline July 1st.